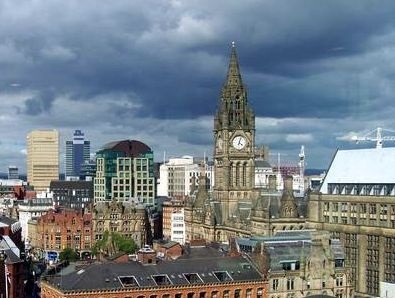 Manchester is a city in the Northwest of England in the UK. As of 2007, the city of Manchester had an estimated population of 441,200, whereas the Greater Manchester Urban Area had a total estimated population of 2,240,230. Manchester is famous for its sporting connections, and is home to the Manchester United and Manchester City soccer teams, as well as having played host to the 2002 Commonwealth Games. Manchester is a city in Northwest England. It lies within the Manchester urban area, the United Kingdom's second most populous urban area. Manchester was the world's first industrialized city. The city grew rapidly ("at an astonishing rate" according to one commentator) in the 19th century due to the Industrial Revolution and a massive growth in textile manufacturing. The Manchester Ship Canal, a 36 mile (58 kilometer) inland waterway connects Manchester to the Mersey Estuary (near Liverpool, and thence to the sea. At the time of its construction in 1894, the Manchester Ship Canal was the longest river navigable canal in the world. Moreover, the canal transformed Manchester from a landlocked city to a major seaport - and for a time, the Port of Manchester was the third biggest in the UK (it closed in 1982). People from Manchester are called Mancunians. Manchester has a motorway ringroad (the M60), which connects to the M602 and M67. Additionally, the M56, the M61, the M62, the M66, and the M67 all serve Manchester as well, and connect to the M60. Within the city, there are extensive bus networks. There are many rail connections available from the city's two main stations at Manchester Piccadilly and Manchester Victoria. The city also has a modern light-rail/tram system (Manchester Metrolink). Manchester Airport is the third busiest airport in the United Kingdom, and connects the city to both domestic and internationald destinations. Manchester is well-known for its sport, and hosted many major sporting events. Additionally, many sports facilities in the city were upgraded relatively recently when the city hosted the 2002 Commonwealth Games. In case you are wondering - Manchester's most famous soccer team, Manchester United, are located just outside the city of Manchester. The Guardian newspaper began as the Manchester Guardian. One of ITV's most important franchises, Granada Television, is based in Manchester. Manchester is home to one of the BBC's main centers of operation. Music fans, may also be familiar with Manchester, as a result of Madchester scene - a British music scene of the late 1980s and early 1990s that mixed dance music, alternative rock music, and psychedelia. Important groups in the Madchester scene included the Stone Roses, Happy Mondays, New Order, Inspiral Carpets, James, the Charlatans, 808 State, and Northside. Lonely Planet England is your passport to the most relevant, up-to-date advice on what to see and skip, and what hidden discoveries await you. Ponder the mysteries of Stonehenge, visit Shakespeare's home town or take in a London show; all with your trusted travel companion. Get to the heart of England and begin your journey now! The Perfect Choice: Lonely Planet England , our most comprehensive guide to England, is perfect for both exploring top sights and taking roads less travelled. Looking for a guide focused on London? Check out Lonely Planet London guide for a comprehensive look at all the city has to offer; or Pocket London a handy-sized guide focused on the can't-miss sights for a quick trip. Looking for more extensive coverage? Check out Lonely Planet Great Britain guide for a comprehensive look at all the region has to offer. 25 Secrets you’d never find out about MANCHESTER! Welcome to the most Complete Manchester Travel Guide for Tourists made by locals! If you are heading to the wonderful city of Manchester anytime soon this book will give you an insight of the best places and most unique places to see where you will mingle with the locals and get to see and do the activities as one of them. Most people don't even take the time to prepare themselves in advance, and just wish for the best once they have arrived! Most people aren't aware of some of the most amazing places Manchestercan offer... And it'd be such a pity to miss them! That's precisely why we desperately need the RIGHT travel guide first. Don’t arrive to Manchester(England) and follow the crowds of Tourists. With this exclusive travel guide made by locals you will be finding about the places that don’t come on Lonely Planet’s or are listed on Trip Advisor where thousands of tourists head daily. Our goal is simple. we will give you a complete and detailed Bucket list with MAPS to all the locations to make sure you won’t get lost in the amazing city of Manchester transforming your trip into absolutely amazing experience. We will help you simplify your path, showing you exactly where the best places are. The places found in this book are the most positively reviewed and recommended by locals and travelers. 2,000 places listed and organized in four groups. "TOP 500 SHOPS" 80 Store Categories. "TOP 500 RESTAURANTS" 86 Cuisine Types. "TOP 500 ATTRACTIONS" Landmarks, Historical Buildings, Museums, Art Galleries, Stadiums, Cinemas, Performing Arts, Arcades. "TOP 500 NIGHTLIFE SPOTS" Lounges, Bars, Pubs, Gay Bars, Hookah Bars, Latin Bars, Sports Bars, Karaoke, Comedy Clubs, Jazz & Blues, Nightclubs, Adult Entertainment and many more options to visit, relax and enjoy your stay.